It is difficult to envision the Middle Ages without heraldry; knights and ladies are routinely depicted with elaborate arms gracing their shields and clothing. The herald himself is also pervasive in the popular imagination, as he announces the arrival of some grandee. Edited here for the first time are some of the texts which detail the relationship between heraldic design and working heralds. 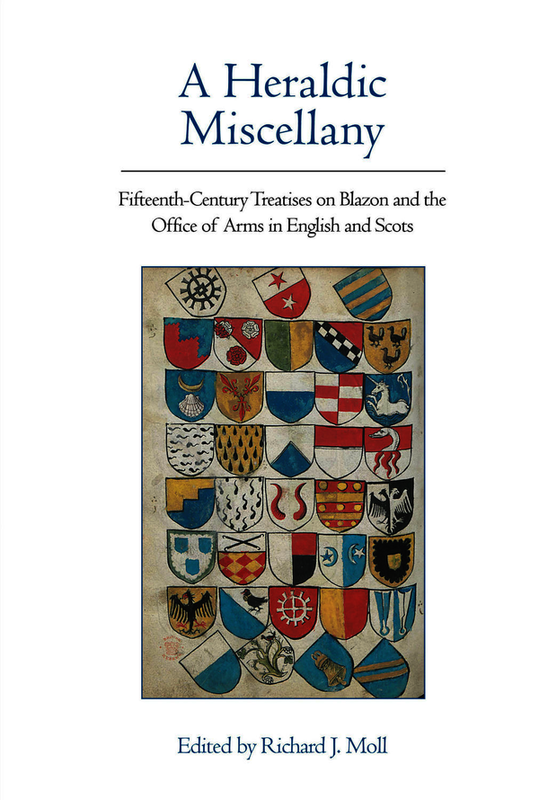 That relationship changed dramatically over the fifteenth century as heralds claimed the right to design, interpret and grant arms according to an elaborate interpretive system. These texts, the work of clerics, heralds and even a future pope, describe the rules of heraldic design and the meaning of colours and charges. They also focus on the role of the herald himself, whether he is serving as a political or personal confidant, or organizing a trial by combat. Finally, they outline an imagined history of the office of arms, claiming that the herald’s authority could be traced to Julius Caesar, the Trojan hero Hector, or even the god Dionysus. These texts, little known in contemporary scholarship, provide valuable insight into the intellectual and visual culture of fifteenth-century chivalric society. Richard J. Moll is Professor of English at the University of Western Ontario. His previous publications include an edition of William Caxton’s The Booke of Ovyde Named Methamorphose (Bodleian Library, 2013) and Before Malory: Reading Arthur in Later Medieval England (University of Toronto Press, 2003). Richard J. Moll is Professor of English at the University of Western Ontario. His previous publications include an edition of William Caxton’s 'The Booke of Ovyde Named Methamorphose' (Bodleian Library, 2013) and 'Before Malory: Reading Arthur in Later Medieval England' (University of Toronto Press, 2003).